Reading and share top 16 famous quotes and sayings about Hippopotamus by famous authors and people. Browse top 16 famous quotes and sayings about Hippopotamus by most favorite authors. 1. "There is a famous Russian cartoon in which a hippopotamus, in the bush, points out a zebra to another hippopotamus: 'You see,' he says, 'now that's formalism." 2. "And you came back to Lyrian?" Galloran said in disbelief. "Believe it or not, I came through the same hippopotamus that brought me here the first time. Jumped into the tank on purpose. I wanted to keep others from wasting their time pursuing the Word. And I couldn't ditch Rachel. "Galloran smiled. "Truly, you are possessed by that species of madness that begets heroism." 3. "There is an eagle in me that wants to soar, and there is a hippopotamus in me that wants to wallow in the mud." 4. "Frankly, I couldn't be more astonished that this guy was involved in something like this than if you came riding through my apartment on a hippopotamus." 5. "Sir Humphrey looked like a sleepy old hippo -- and when he yawned in that big, big, hippopotamus way Charity couldn't help doing likewise." 6. "The Natural History Museum is open to the public on Tuesdays and Fridays. Elephant, rhinoceros, hippopotamus; extraordinary animals! Rubens rendered them marvelously. I had a feeling of happiness as soon as I entered the place and the further I went the stronger it grew. I felt my whole being rise above commonplaces and trivialities and the petty worries of my daily life. What an immense variety of animals and species of different shapes and functions!" 7. "How dare you suppose that I don't know who you are or what you are? That I don't understand what I see? Do you take me for some kind of besotted schoolboy? It is unspeakable! 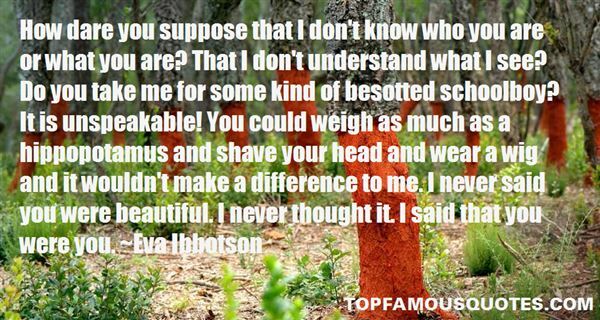 You could weigh as much as a hippopotamus and shave your head and wear a wig and it wouldn't make a difference to me. I never said you were beautiful. I never thought it. I said that you were you." 8. "A city is where you can sign a petition, boo the chief justice, fish off a pier, gaze at a hippopotamus, buy a flower at the corner, or get a good hamburger or a bad girl at 4 A.M. A city is where sirens make white streaks of sound in the sky and foghorns speak in dark grays. San Francisco is such a city." 9. "Emily said ... Well, I read that it's important to sleep. While you sleep, the hippopotamus in your brain replays things that happend during the day, e.g. what you studied. So therefore it remembers it for you." 10. "He said he would come in,' the White Queen went on, `because he was looking for a hippopotamus. Now, as it happened, there wasn't such a thing in the house, that morning. 'Is there generally?' Alice asked in an astonished tone.Well, only on Thursdays,' said the Queen." 11. "Is a hippopotamus a hippopotamus, or just a really cool Opotamus?" 12. "Dressing, I chose the second shirt, the one softened in the mouth of a trained and perfumed albino hippopotamus and made entirely of pigeon's wool, because it goes better with the shoes than the one stitched with baby hair." 13. "Hartwell's subconscious was treated to a lengthy reel of the evolutionary tract of cetaceans – from their early days as hoofed creatures with triangular teeth like wolves, to cat-like creatures, to early variations of the hippopotamus, to bottlenose dolphins and Orca, the ‘killer whale', which is the largest species of dolphin. The hybrid mammal also had the ability to convert to a smaller aquatic mammal, capable of diving into water and hiding beneath the surface to avoid birds of prey." 14. "The full extent of Samuel's powers had yet to be determined because he was in a Claire Vinson daze for much of his rapid acceleration to adulthood. 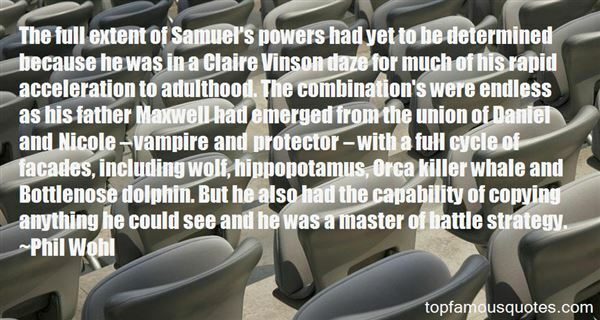 The combination's were endless as his father Maxwell had emerged from the union of Daniel and Nicole – vampire and protector – with a full cycle of facades, including wolf, hippopotamus, Orca killer whale and Bottlenose dolphin. But he also had the capability of copying anything he could see and he was a master of battle strategy." 15. "Has a confrontational ring to it, doesn't it? Like saying, the sky is rubber, or, your foot's a hippopotamus." 16. "I found in one of the tombs an inscription saying, 'If you touch my tomb, you will be eaten by a crocodile and hippopotamus.' It doesn't mean the hippo will eat you, it means the person really wanted his tomb to be protected." It felt like I'd only just fallen asleep when someone shook me awake. I pushed the person off, snuggling deeper in my covers.It wasn't until I had buried my face in my pillow that I realized I should probably be alarmed that someone was in my room. What with evil trolls trying to kidnap me and all that."